The ‘Tarot of the Most High’ is a tarot card deck inspired by the Bible. 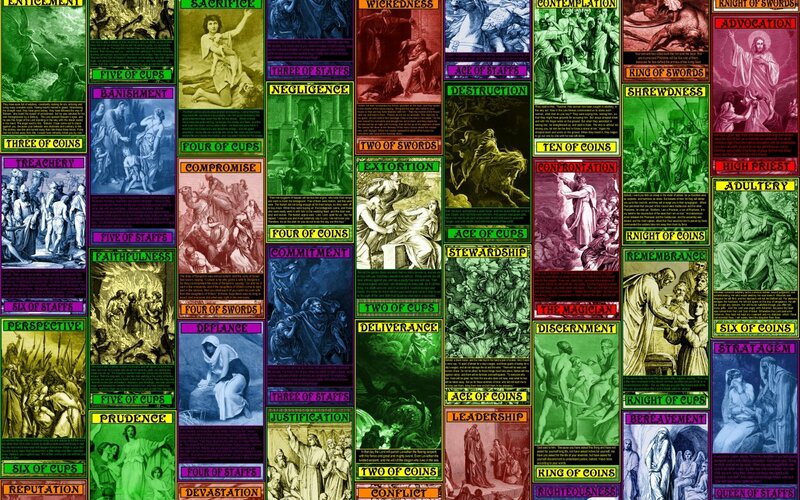 It includes depictions of events from the Old Testament, New Testament, and the Apocrypha. Each card includes an image, a key word (describing the overall theme of the card), and a section containing relevant Bible verses - providing ample symbolism/themes for enhanced tarot readings. These are not cards with fluffy inspirational Bible verses on them, but like the Bible, contain mature content documenting the interaction between God and human-beings, and human’s struggles with evil throughout history. You can learn from the sins, temptations, adversity, and struggles of Biblical characters, for your personal growth, and/or reflect on God's interaction with mankind in the past, present, and future. The images on the cards are recreations based on public domain images taken from ‘The Bible And Its Story Taught by One Thousand Picture Lessons’(1910), ‘Die Bibel in Bildern’(1872), and ‘Dore Bible Gallery’(1883); with artist such as Hans Burgkmair (1531), Albrecht Durer (1528), Julius Schnorr von Carolsfeld (1872), and Gustave Dore (1883). Many of these beautiful images might have been lost to obscurity, but were recreated here so that another generation can view their artwork and reflect on God’s word. Tarot Card decks consist of 78 cards divided into two sections and four suits. The two sections are the Major Arcana (Table One) and the Minor Arcana (Table Two). The Major Arcana is made up of 22 cards, labeled with Roman Numerals starting with zero and going up to 21. The Minor Arcana is similar to a standard deck of playing cards, but it includes four extra cards. Instead of cards numbered 1 through 10, Jack, Queen, King, the Minor Arcana has cards numbered 1 through 10, and then has a Page, Knight, Queen, and King. In the Tarot of the Most High, the cards in the Major Arcana are associated with the Mysteries of God and His foreordained plan, and the cards in the Minor Arcana deal primarily with humanity’s struggles against evil and mankind’s interactions with God, evil, and other humans. Generally, the Major Arcana deals with spiritual concepts, and the Minor Arcana addresses more earthly ones. The Minor Arcana is divided into four suits: Cups, Coins, Staffs, and Swords. Certain attributes are associated with each of the suits, but in order to avoid the topics being too narrowly focused, some leeway/flexibility was applied. The cards in the ‘Cups’ suit focus mainly on topics related to ‘Destiny’ and sacrifice. They address topics such as faithfulness, martyrdom, and concepts such as ‘death before dishonor.’ They explore the lives and integrity of people who placed their commitment to God above their own lives, and their trust in God’s providence. The cards in the Cups suit deal with God’s interactions with mankind, and humanity’s trust and commitment to God. The primary theme of the ‘Swords’ suit is ‘Adversity’, and the cards deal with interactions between humans. Many of the cards in this suit depict King David’s struggles in life, and can be used to help you understand how to get ahead in life while overcoming temptations and obstacles. Also included are the lives of people who were confronted with great wickedness/tragedies, and the need to balance one’s priorities and/or responses in difficult situations. The cards in the ‘Staff’ suit are primarily associated with ‘Discipline.’ You can think of a Staff as a ‘Rod of Reproof’ – although that verse (Proverbs 29:15) is not actually included in this deck. The Shepherd’s Staff was used to both guide and discipline the sheep. This suit of the Minor Arcana deals with topics related to learning lessons, growing in knowledge, finding one’s way in the world, and overcoming challenges in order to become successful. The main theme of the cards in the ‘Coins’ suit is ‘Wisdom.’ This suit deals with situations where wisdom is put into practice, whereas the situations in the ‘Staffs’ suit describe the trials through which wisdom is developed. Wisdom is associated with coins, because wisdom states, “Receive my instruction, and not silver; and knowledge rather than choice gold.” (Proverbs 8:10), and Jesus stated, “I counsel thee to buy of me gold tried in the fire, that thou mayest be rich” (Revelations 3:8). This suit deals with how wisdom is applied, and how people’s faith is tested (tired by fire) to determine their worthiness. The cards in the Major Arcana are sometimes described as depictions of ‘the Fool’s Journey’, and are said to portray his growth and voyage through life. In the Tarot of the Most High, the Major Arcana deals with understanding the Mysteries of God. The Fool card can still be viewed as the naïve children of God at the beginning of their journeys, but the journey through the Major Arcana of the Tarot of the Most High deck is one of spiritual development. The Fool card represents a naïve youth faced with the need of learning or using discernment in order to navigate the obstacles he/she will face in the world. The Magician card depicts Moses, and deals with confrontation. Unlike the Fool (who had the choice of either following or ignoring his father’s advice), Moses had a personal relationship with God. He trusted in God and served as God’s instrument on earth. As in the Rider-Waite Tarot Deck, The High Priestess card is associated with the Secret Church (the one built without hands), and the Bride of Christ. Expanding on the concept of being instruments of God, Christ’s Bride is called to be a Holy Priesthood and for each member to let their lights shine on earth. The Empress Card represents the Woman Israel described in the book of Revelations or the last Eve. Her story depicts the rebellion of the Satan, the war in Heaven, the birth and redemption of Christ, God’s protection of Israel, and God’s preordained plan from the foundation playing out. The Emperor card represents God, and our reliance on Him to direct and work in our lives. The High Priest Card depicts Jesus, who serves as mankind’s advocate to his father. The Lovers Card depicts Tobias and Sarah, but the devotion within a marriage is a metaphor for God’s relationship with humanity. The Church is the Bride of Christ, and humanity is able to understand God and our relationship to Him, through our earthly relationships and marriages. The Chariot Card represents God’s will on earth, guardianship, and influence through earthly governments. The Strength Card depicts Samson and Delilah and addresses the concepts of strength and influence – you can be influenced by God and follow your conscience or you can be driven by temptation and left vulnerable to evil. The Hermit Card portrays Daniel in the Lions’ Den, and demonstrates God’s influence (over the lions) in response to Daniel’s willingness to follow God. The Wheel Card displays Ezekiel’s wheel, cycles of life, and all things working in accordance with God’s will (events in the Bible often occurred as a foreshadowing of the events to come). The Justice Card portrays the Lamb of God, which is central in God’s plan and was ordained from the foundation of the world (1 Peter 1:20, Revelations 13:8). 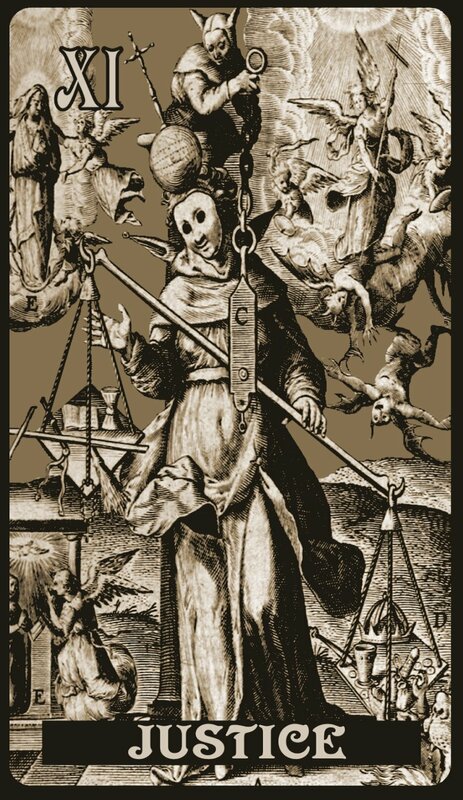 The Hanged Man Card depicts Christ crucified, which is the reason He is considered the Lamb of God. The Death Card portrays the Angel of Death killing the first born in Egypt, but passing over God’s chosen people – who have the blood of the lamb on their doors. The Temperance Card shows the Baptism of Jesus. It is through Baptism, that followers of Christ can be sealed for redemption, and overcome death be accepting the blood of the lamb. The ‘Devil’ card depicts Adam and Eve being tempted in the Garden of Eden. It is due to them eating from the ‘Tree of Knowledge of Good and Evil’ that death entered the world, humans are able to understand choices and consequences, and the need for redemption and salvation were created. This is the beginning of God’s plan being put into motion. The ‘Tower’ card represents God’s intervention in the world. God caused division among humans, and called Abraham to follow Him and to become a chosen people. The ‘Star’ card portrays the ‘Star of Bethlehem’, and the manifestation of God’s salvation to mankind through the birth of His son. It is through Jesus that God’s promises to Abraham were extended to the gentiles. So that all those to elect to follow their heavenly father’s advice/commandments, may accept the blood of the lamb, so that death will pass other them, and they may have their sins forgiven. The ‘Moon’ card represents the breaking of the Six Seal in the Book of Revelations, and the realization of those on earth regarding the truth of God’s existence (there will be signs at the end times, such as the moon being turned to blood). Traditionally, within the Tarot, the ‘Moon’ is referred to as the false light. The moon is the opposite of the sun, but unlike the sun, the moon is lifeless. The moon does not produce any light on its own, but is only a reflection of the light of the sun shining on the other side of the world. Christians are told, “Ye are all the children of light, and the children of the day: we are not of the night, nor of darkness (1 Thessalonians 5:5).” The ‘Sun’ and the ‘Moon’ cards are in direct contrast of each other. The ‘Sun’ card displays God’s blessings to His followers, and the ‘Moon’ card portrays the children of the night at a time of distress – when they finally realize the results of their choices. The ‘Judgment’ card represents the Final Judgment of God, where every individual will be judged according to his/her deeds. It is a day of punishment and reward, rejoicing and sorrow; dependent on each individual’s actions. The final card in the Major Arcana is the ‘World’ card, and represents the New Jerusalem and God’s promised world to come; which will exist without any evil, sadness, or pain in it. It is the final outcome, and what all of the other previous aspects of God’s plan has led up to. The ‘Judgment’ and ‘World’ cards portray the final outcomes of the children of the light and the children of darkness; once the Shepherd has separated the sheep from the goats, and everyone goes to their final abode – as written in the book of Matthew. Matthew 25:31-46 When the Son of man shall come in his glory, and all the holy angels with him, then shall he sit upon the throne of his glory: 32 And before him shall be gathered all nations: and he shall separate them one from another, as a shepherd divideth his sheep from the goats: 33 And he shall set the sheep on his right hand, but the goats on the left. 34 Then shall the King say unto them on his right hand, Come, ye blessed of my Father, inherit the kingdom prepared for you from the foundation of the world: 35 For I was an hungry, and ye gave me meat: I was thirsty, and ye gave me drink: I was a stranger, and ye took me in: 36 Naked, and ye clothed me: I was sick, and ye visited me: I was in prison, and ye came unto me. 37 Then shall the righteous answer him, saying, Lord, when saw we thee hungered, and fed thee? or thirsty, and gave thee drink? 38 When saw we thee a stranger, and took thee in? or naked, and clothed thee? 39 Or when saw we thee sick, or in prison, and came unto thee? 40 And the King shall answer and say unto them, Verily I say unto you, Inasmuch as ye have done it unto one of the least of these my brethren, ye have done it unto me. 41 Then shall he say also unto them on the left hand, Depart from me, ye cursed, into everlasting fire, prepared for the devil and his angels: 42 For I was an hungry, and ye gave me no meat: I was thirsty, and ye gave me no drink: 43 I was a stranger, and ye took me not in: naked, and ye clothed me not: sick, and in prison, and ye visited me not. 44 Then shall they also answer him, saying, Lord, when saw we thee hungered, or athirst, or a stranger, or naked, or sick, or in prison, and did not minister unto thee? 45 Then shall he answer them, saying, Verily I say unto you, Inasmuch as ye did it not to one of the least of these, ye did it not to me. 46 And these shall go away into everlasting punishment: but the righteous into life eternal.